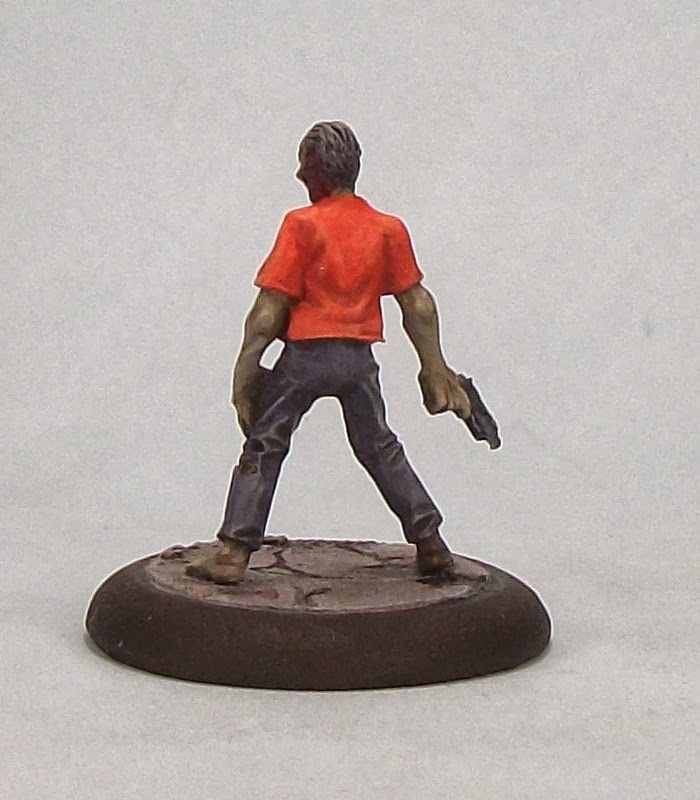 So another Zomtober draws to a close (for most; some die-hards are still adding to their walking dead and survivor stock-piles! Good on you guys! ), and here are the four minis I managed for the project. I am very happy because I hit all my planned deadlines (for me that is a 'big thing') plus I also managed to finish off another six minis for other games and ranges, so my most prolific month of the year so far! Finally, if Zomtober participants want to add a comment below, then I will tally up everyone's undertakings in this post. Jon Shields: 12 zombies and 3 survivors. Matt: 15 regular zombies, plus one giant super zombie! Guys, if you add your name and Zomtober output to the comments I will update the list accordingly. Posted with a day to spare, and finished 4 days early; get in! The last of my Zombie Clowns for now; I would like to find at least one more that fits well enough with the two smaller Tengu ones. 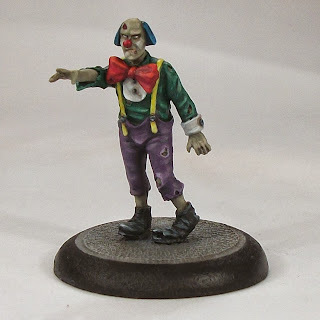 In Zomtober I have added 4 Zombies to the 'horde', and done enough work on at least one other Zombie to finish it quite quickly when I feel like doing so, and in all have painted 10 minis this month (so far: 4 Zombies; 4 Anima Tactics; 2 Pulp City), taking me to 53 minis painted for the year, and surpassing the target I set for myself at the beginning of 2013. Time to aim for 60 painted minis in 2013 now I think! Anyway here is the last of my Zomtober entries, and I just wanted to take a moment to say 'very well done' to everyone who has taken part or offered encouragement. In the next couple of days I will post a thread so people can comment their totals and we can track just how many extra Survivors and Zombies were added to the Zompocalypse in Zomtober 2013! Zomtober has helped a lot to give me a boost with bother painting, including some Undead stuff for Anima Tactician. This stuff could have qualified for Zomtober, but I decided it should not deter me from painting some of the Zombie backlog, so I did not count them towards the targets. 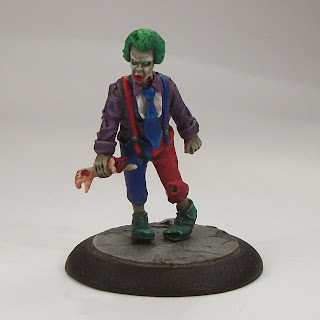 After the lead in of the Anima Tactics mini earlier, here is my intended entry for week 3 - another Zombie Clown. This one is also by Tengu, and is one of a pair that have separate heads and arms to add variety. 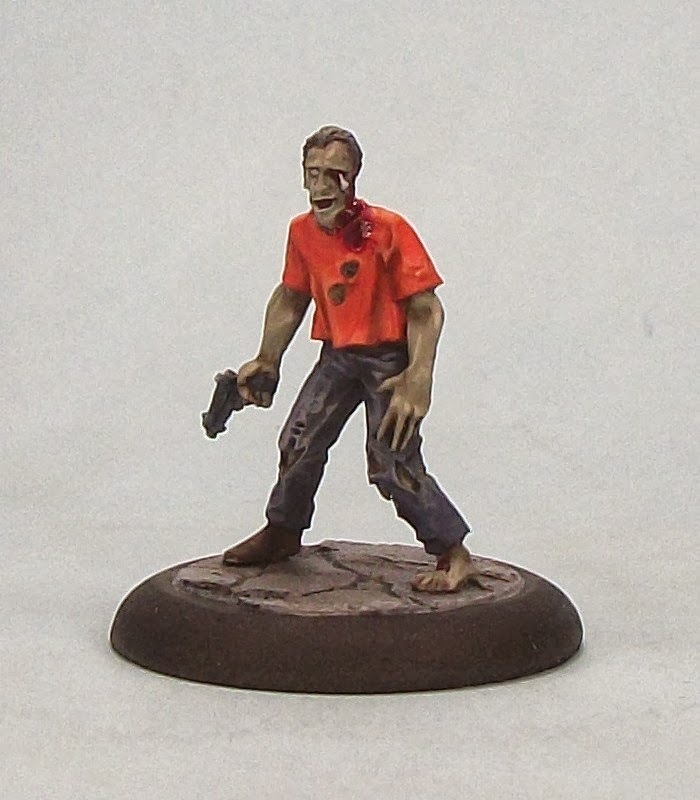 This is my 24th Zombie in total, and also the 49th mini I have painted this year. The Zombie horde (well horde is being generous, but what else can it be called?) started a couple of years back, and has so far only really featured in games of Pulp City, but I have been working up some ideas for a Zombie rule-set, so Zomtober has proven a productive period for me in more ways than one. Aside from Zomtober, I began the year with the intention of painting at least 50 models after the paltry 24 completed by me in 2012. well I have now doubled 2012's total, and I am very close to achieving my my target with a couple of months to go. I am a slow painter who loses motivation quite easily, so I am pretty chuffed with my output so far. If I could hit 55-60 minis painted in 2013, that would be very cool. Assuming I hit my original goal, I may stretch the target in blocks of 5 and see how I progress. 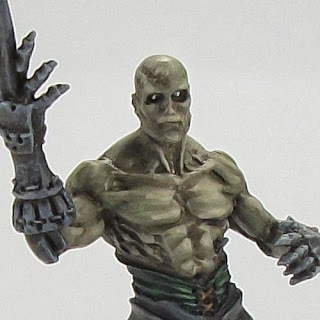 I should have my next Zomtober mini finished later, but in the mean-time, there is this Undead I have posted to the Anima Tactician. More images and discussion if you follow the link. My Zomtober motivation has spilled over into other things which is cool. Another week, another deadline met, another walker added to the cause! I will never be as prolific as so many of the guys taking part in Zomtober, but I hope for all of us it is about getting something done we may have been struggling to do otherwise. 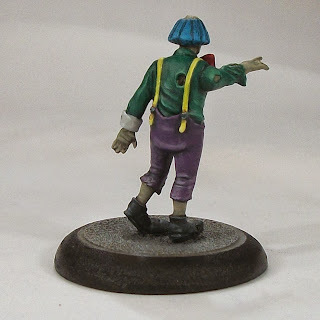 For me that is certainly true - this mini was started many, many months ago and is only now at last complete. 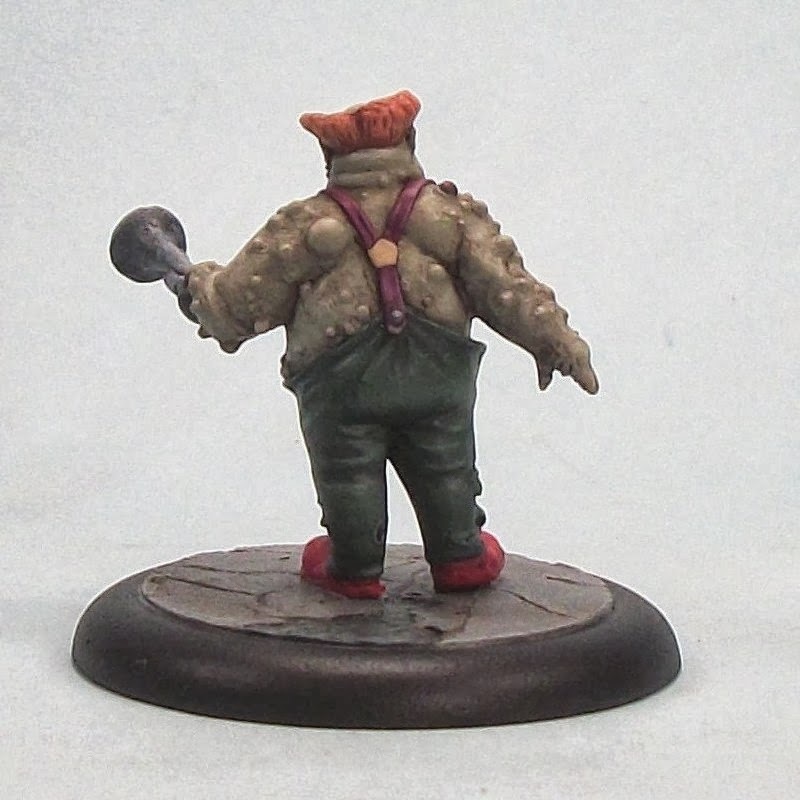 He is the second of a planned trio (since I paint my Zombies to match up in groups of 3), and although not brilliant, he will do. The orange was a bugger to do though! 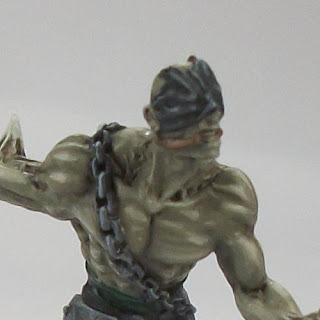 Engaging in Zomtober has actually helped me get paint on to non-Zombie minis, so that is positive too. For example I finished Cenette here on my Anima Tactician blog simply because of renewed motivation, which was a nice bonus. 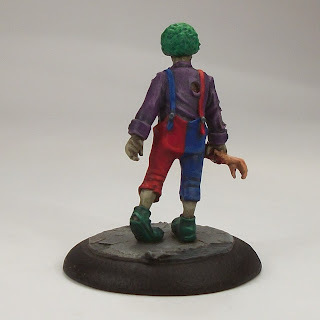 Back to Zomtober, I was thinking I should create a central post listing everyone who took part and how much they achieved (whether 1 mini or 100 hundred, it doesn't matter, just taking part and getting stuff finished is the key). 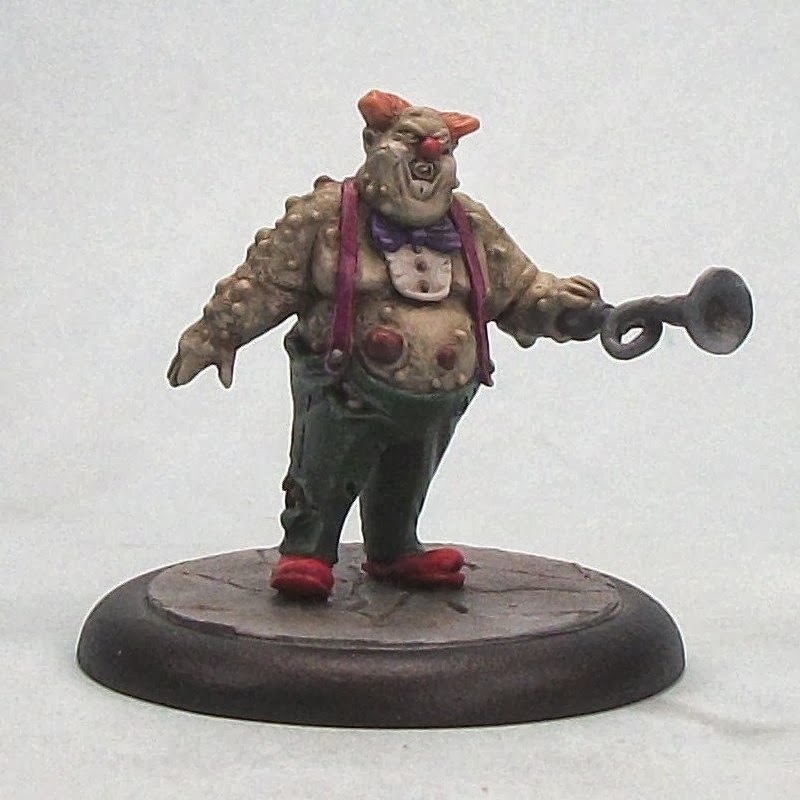 Coming up I don't yet know if it will be more Zombie Clowns or the last of this 'orange trio' next. Stay tuned. And finally, good luck to everyone with each week of Zomtober. Whew, first deadline achieved! Always a good start. Lots of the Zomtober participants have posted their first minis, so it looks like Zomtober 2013 is off to a flying start. There is some great stuff being posted, and it is cool that some who have been struggling to 'get stuff done' are using Zomtober as a spur to tackle some minis - which is a key part of the Zomtober philosophy. I heartily recommend chasing down the stuff people have been posting,m and the blog roll to the right is a good indicator of their progress. 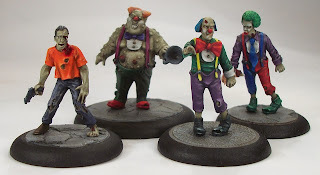 This year I am trying to through some clown Zombies (as well as finishing off another triad), because as scary as the walking dead may be, undead clowns are scarier still, surely! This one is from Tengu Models, and another addition to my range of Big/Boss Zombies; the other two Clown Zombies are more 'normal' size, also from Tengu. I have just been over to the Tengu site, and I will have to pick up some more from them soon as they have some great stuff. I find they scale nicely with the Studio and Hasslefree Zeds. The base is Fenris as is usual for my Zeds. So that is Week 1 done for me, and I have been doing bits of work on the other target models.